Make a stance against wimpy massage by taking our Advanced Ashiatsu massage training CE course! 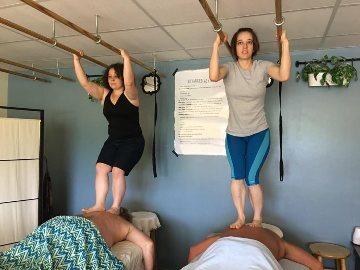 After you’ve completed a live barefoot massage program (like our Fundamentals or another 16-24 hour program), come back to class and discover how to use your body to its fullest on your bigger clients! Our 2 footed strokes class offers high quality continuing education for the massage therapist wanting effective deep tissue massage training. know which strokes are appropriate for your clients, whether they are 1 footed, 2 footed, or modifications. have more moves for the clients you can't use 2 feet on. understand why females aren't typically well suited to receive the 2 footed strokes. be able to adapt new strokes into your existing protocol. work bi-laterally on your bigger clients with traction, compression, and glide. Like with our Fundamentals class, you'll feel every stroke from your instructor (me). On the 1st day of Advanced Ashiatsu training, you will work on other LMT's in the class, where you will first learn contraindications and the single footed versions of every "double footed" stroke. These one footed modified strokes are perfect to add more tools to your existing barefoot massage repertoire and can be performed on all of your existing clients. You'll experience both the single and double variations to truly understand the full essence of Ashiatsu. Keep in mind that your 2 footed strokes are meant for bigger male clients, so both the therapist working and I will need to hold up our weight on you! We focus on safe, thorough training on how to apply two footed strokes with ease and utmost safety. The ideal client for these moves is healthy, dense, thick muscled, large framed men. You know the type-those who are usually very difficult to massage using traditional hands on techniques and even make you struggle to give pressure with using your Barefoot Basics strokes. On the 2nd day, you'll have bodies galore to work on all day, guys who are experienced in receiving Ashiatsu barefoot massage and who love deep pressure. You'll finally have the opportunity to really experiment with the potential of using your full body weight and both feet on every stroke. You'll be working on your physical endurance this day - you'll learn when you allow your weight to sink in, and when to gracefully hold some of your weight in the bars, pushing you to control every movement as you work both sides of your client's body at the same time. After training, your own self-study Advanced Ashiatsu Certification process begins with documented practical sessions, and testing based on the information provided in class. Our complementary Membership Site (coming soon) will have video and photo review of all the strokes as well as forms you can download. A live 16-24 hour barefoot massage class is required ahead of time, with proof of CE's. Supine and Sidebody or equivalent is also required. The quickest way to get in shape. Seriously. This is the program I use. It only takes a short time commitment. (Click the banner below). 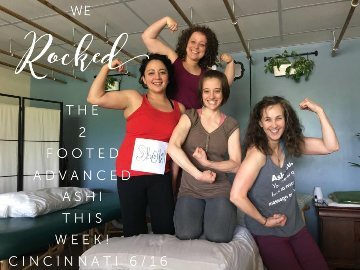 If you’re signed up for Advanced Ashi or are thinking about it, most likely you’re also wondering if you are in shape enough for class! Remember that the 2 footed strokes are best suited for clients (primarily men) who are ideally 100+ pounds more than you are. So if you’re 135 lb, your clients for the 2 footed strokes should be at least 235 lb (you catch my drift). The insane thing about taking the Advanced 2 footed strokes is that you spend the first day learning on women who are not going to weigh enough. And their frames are too little for you and even for the instructors to demonstrate the strokes on. All of the instructors demonstrate the 2 footed strokes on each therapist in class, and we try to hold up our weight as much as we can. And we don’t like it. Why? As we told you in class, the two footed strokes are meant for men, large men, large healthy men to receive. So we’ll teach you how to modify the strokes on day 1, and you’ll learn new things to add to you repertoire for clients who need less pressure. You may not even put two feet on your client until day 2. But that doesn’t mean you don’t have to be in GREAT shape to take the class! Primarily, work on your abs. Your core strength needs to sustain you during class. Biceps, lats, pecs too. Or you’re going to feel after the first day of class that putting on deodorant is waaaay too much pressure. Stand on your massage table. Grip one hand on each bar and lift your legs up. Try to hold your legs up for at least 15 seconds. Do this every day in between clients. It’ll really help you in the long run. “V” sit ups are a great way to work your entire abdominal wall. Lie flat on your back, then simultaneously lift up both your arms and feet up to form your body into a “V” shape. Don’t worry if you initially look like a dying beetle. It gets better. Need a refresher before class? Let me know-private tutoring is available. ↬ Pull ups / chin ups. Don’t worry if you can’t pull up all your weight in the beginning. It’s ok if you have a hard time with doing one! A good way to help get you started is to use a chair or stool—place a foot (or both, if need be) on the stool when you start your chin ups. 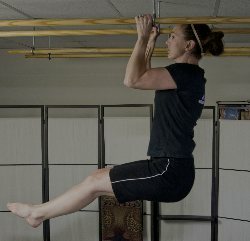 This will take up to half your weight off and make it possible for you to do chin ups! As time goes on, you may find that you don’t even have to use the stool any more! ↬ There are plenty of exercise programs that can help you get into better shape. “Ab Ripper X” from P90 X is a great 16 minute workout that can really help. Pilates, core strengthening with an exercise ball, “Insanity” etc. will help you work on the strength you need for class. My personal favorite is BurstClub, a high intensity, interval training that can be done in 3 minutes for abs and 15 minutes for fully body workouts (that includes stretching). This isn’t meant to terrify you, but instead give you a realistic idea of what to expect in class. If you can’t hold up your weight off your clients, you will blister your hands and can become a danger to both you and your client. Getting ready for class by improving your strength will help make class an enjoyable course for all involved!